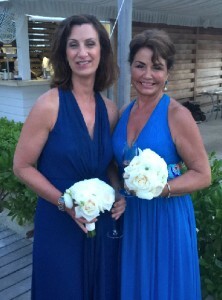 Last week, the founder and Medical Director of BioBalance Health, Dr. Kathy Maupin, traveled to the islands of Turks and Caicos for her daughter’s wedding. She wants to share with you the steps she took to look her best for the very special occasion! My daughter’s wedding was the most important event in my life, since my own wedding 37 years ago. My concerns about looking youthful and beautiful were put to rest on the day of her wedding because of the work I put in beforehand. Everything came together and I felt absolutely wonderful with the help of the skin care products and services we offer at BioBalance Health! My preparation for the wedding was extensive. I was following the BioBalance Health Medicated Weight-Loss program, which included adhering to a diet that was chosen for my individual metabolism. Exercising every other day, I also received a series of skin care services that I will continue from now on. I realized that I should look as good as I did for my daughter’s wedding every day. 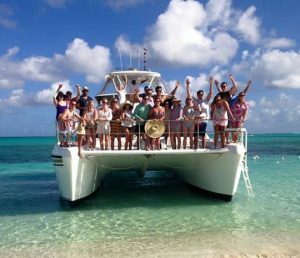 Enjoying the week leading up the Dr. Maupin’s daughter’s wedding on the Turks and Caicos Islands. I began my skin preparation by receiving monthly Jet Peels six months before the trip. This rejuvenating treatment does an incredible job exfoliating and hydrating your face, neck, décolleté, hands, and upper arms. That is also when I began a series of i-LipoXcell fat-reduction treatments that were perfect for removing the lumpy areas I had around my belly, back, thighs, and backside. This is a non-surgical treatment that uses laser technology to remove fat and tighten skin. It’s like liposuction, but without the knife. Faithfully receiving these treatments and adhering to my personalized weight loss program allowed me to confidently wear a bikini last week. My final series was to tighten my skin on the areas where I lost fat. This was accomplished through the Q-Switch laser on my chin, chest, upper arms, and upper back. Then, a few weeks before the wedding, I went to Abbie Calabio (the expert injector at BioBalance) to smooth out my face. She filled in the wrinkles around my eyes and mouth with Bellafill, the long lasting wrinkle correction, and Botox. I also tried our newest product, Restylane Silk, to smooth out the lines on my upper lip and add fullness to both of my lips. Dr. Kathy Maupin and her son-in-law’s mother. We arrived on the islands a week before the wedding to enjoy the company of our close friends and new family. We were so glad that the groom’s parents were able to join us. This meant leaving the harsh Missouri winter for what is equivalent to our July sunshine. For protection, I applied the BioBalance Image SPF 32 Tinted Matte Sunscreen every day. I kept to my daily routine of Biobalance Skin products: Camomile Wash for Dry Skin (#1), Camomile Toner (#2), and Revitalizing Moisturizer (#3). After being in the sun, I rinsed off with water and slathered Botanical Gel all over the parts of my body that were exposed, to heal the burn and the damage caused by the sun. Then, I gently applied Collagen Cream (#4) to my face, neck, and hands, followed by our amazing Revitalizing Eye Gel. This regiment not only gave me the protection I needed to have beautiful skin at the end of the week, but it also provided recovery from the extended exposure to the sun. Thankfully, it all came together to make me feel confident and beautiful! Hormone Replacement Pellet Therapy for the past 13 years laid the groundwork, while all of my other treatments reversed what time had caused. I am so happy that I invested the time and money into looking my best for Rachel’s wedding—those pictures will last forever! Get the details of each treatment listed in Dr. Kathy Maupin’s preparation regimen here!